Phycox HA Soft Chews For Dogs 120/bottle - Pack of 6 taste great to dogs, but the HA formulation contains no mammalian protein! That makes them safe and efficacious for your allergic canine patients. Together with our HA Small Bites Canine Soft Chews, Phycox HA Soft Chews are another part of Phycox's hypoallergenic range and were designed for the larger dog. While Small Bites are intended for dogs weighing under 30 pounds, Soft Chews are appropriate for dogs that come in at 30 pounds or over. This ensures that larger dogs receive an appropriate dose of Phycox in an easily administered and highly palatable chew. 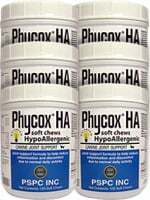 Phycox HA Soft Chews Hypoallergenic contain exactly the same blend of our proprietary anti-inflammatory ingredient Phycox and other potent anti-oxidants and anti-inflammatories as our other formulations. They contain the proven safe and effective joint supplements glucosamine and methylsulfonylmethane (MSM) for maximum joint and bone health. These hypoallergenic Soft Chews are highly palatable and the vast majority of dogs find the taste appealing, so they can be used either alone as healthy treats or mixed with the dog's food; whatever the caretaker finds easiest. Phycox HA Soft Chews Hypoallergenic contain no mammalian protein or grains, making them the most appropriate Phycox choice for dogs with food allergies. There is no beef, chicken or wheat, which are the most common canine allergens. The natural liver flavor comes from pork liver and therefore should not cause problems in dogs with allergies, while still ensuring that the chews are highly palatable to the vast majority of dogs.